Author: Unknown | Posted at: 1:22 PM | Filed Under: consumer marketing, CW, digital media, innovation, internet, Joost, Supernatural, Veronica Mars, Warner Bros.
A little more than two years ago, Warner Bros. Television Group (WBTVG) announced it would make hundreds of movies and television shows available for purchase over the Internet. They’ve come a long way since then. 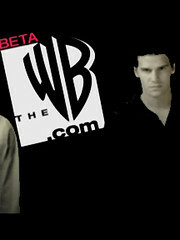 “The launch of TheWB.com [beta] represents a natural progression of the Warner Bros. Television Group’s digital strategy and complements our core business, which is based upon episodic storytelling, first-class distribution and providing value to partners through advertising in a premium environment,” said Bruce Rosenblum, president of WBTVG. The move also solidifies the continued shift toward total broadcast-Internet convergence, especially since Warner Bros. will be adding original short form content. Currently, the WB beta site is offering full episodes of All Of Us, Blue Water High, Buffy the Vampire Slayer, Dangerous, Friends, Gilmore Girls, One Tree Hill, Smallville, The OC, and Veronica Mars. What will be especially interesting is if the new site might even provide viewers another opportunity to resurrect some shows that did not perform well according to Nielsen ratings. Several had developed strong Internet fan bases, including Veronica Mars, Moonlight, and Supernatural. Moonlight fans found out their show was cancelled in May while Veronica Mars fans are still working hard to see their favorite detective move from the small screen to the big screen. (Supernatural has at least one more season left on The CW; we hope many more.) According to fans, all of these shows have a following that is not well represented by Nielsen. For WBTVG, the move toward an all-digital network might also provide marketers and advertisers with more options than investing exclusively in their own original content to reach an audience that is already outpacing traditional media. The primary advantage for WBTVG over other networks seems to be that they are unencumbered by any attachments to traditional media. For them, it’s simply full steam ahead. That seems off subject, but worthwhile.